Business Spotlight – Penn-West Gold & Diamond Co.
“There’s gold in them thar there hills” was the saying from the gold rush days, but while there isn’t any gold in our hills, there may be some sitting in your jewelry box, dresser drawer or safety deposit box that could bring you lots of cash. 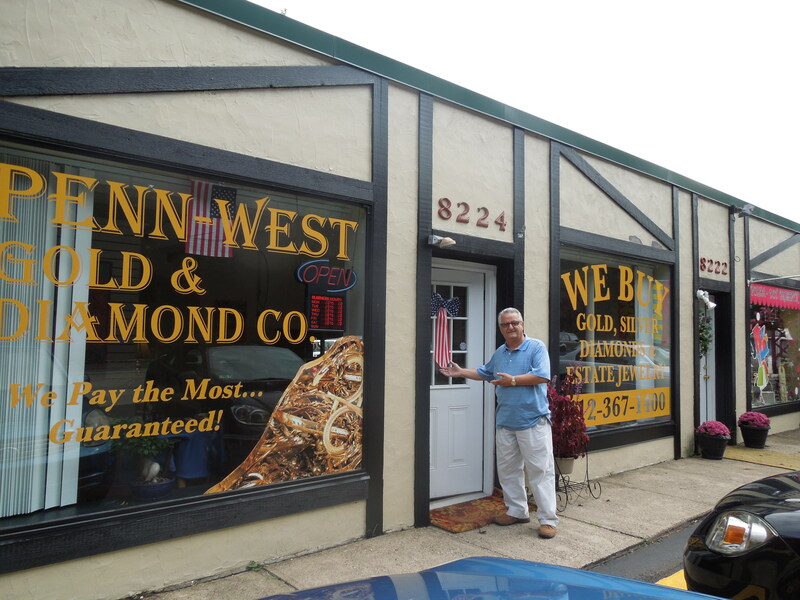 Penn-West Gold & Diamond Co., located at 8224 Perry Highway, near the Ross Twp., McCandless border opened on August 1, and buys most anything of value. “In addition to gold, we buy silver, which is now trading at $34 an ounce, diamonds, coins, estate jewelry and old watches. “We are licensed and our scales are registered, and we pay the highest on-the-spot in cash,” said Dastranj. Chris Pfender is Penn-West’s diamond expert, and because the company is a wholesaler, Penn-West can also help you to purchase engagement rings at wholesale prices. “If you tell us what you have in mind, we can save you a lot of money. For example, we can get you a ring which would cost $30,000 retail for around $16,000,” said Dastranj. Although only open a few weeks, Penn-West Gold & Diamond Co, has already seen quite a bit of referral services. On Sept. 20, it held its Grand Opening Gold Party, and if you missed that, the company will help you to host your own gold party, whether at your home, school, organization or church. “If you have at least 10 people, we will come and bring refreshments and pay cash for gold and other valuables,” Dastranj said. In addition, Penn-West Gold & Diamond Co. has a showroom where you can browse and purchase their treasures. Dastranj is also an accomplished artist and his paintings are also on display and can be purchased. “People who deal with us like us,” said Dastranj who invites you to drop by or call 412-367-1400. Penn-West Gold & Diamond Co. is open 10 a.m. – 6 p.m., Monday through Thursday, 10 a.m.-5 p.m. on Friday, and Saturday from 10 a.m. – 4 p.m.